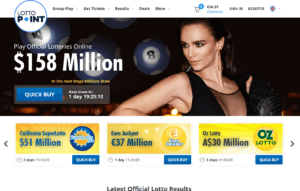 LottoPoint Review | Find Out How Good this Online Lottery is! For the most part, LottoPoint’s online lotto betting service feels half-baked. It’s a shame, really. Were it not for their odd syndicate share ratios; the ridiculously few payment methods they accept; and the limited languages they support, I would have scored them a bit higher. After all, they do offer over 22 different lottery games for you to choose from and they do make it easy for players to claim their winnings. Even better, they don’t take a percentage from your winnings! But, hey, if you can get past their shortcomings—and if you don’t have a problem with lotto betting—LottoPoint is still worth a look or two (especially because of their deals). Read on to learn more about them! UPDATE 2/11/2018: LottoPoint has been difficult to find information on due to their official website being down for an extended period of time. It's definitely not a good sign, so I'd highly recommend you check out our review on TheLotter, instead. It's Lottery Critic's top pick for buying online lottery tickets. LottoPoint, formerly Lotto365, is a lotto betting site that allows players from all over the world to bet on the outcomes of official lottery draws. Unlike other lottery sites, they don’t buy actual lottery tickets on a player’s behalf. They take out insurance via their partner, Emirates, to ensure all players get their prizes. They are licensed and regulated by the Curacao Gaming Commission. LottoPoint doesn’t stray far from the norm in terms of playing online lottery. That is, if you’ve played in lottery sites before, this one should immediately feel familiar. Log in to your LottoPoint account. Choose from any of the available games. Pick your numbers. You can do so either manually or, if you want your numbers chosen for you, you can click on the “Random Numbers” button. Choose how many lines you want to play. Choose the number of draws. You can also subscribe if you don’t want to miss a single draw. Click on the blue “Proceed” button once you are done. Confirm your order details and hit the “Submit” button. If you don’t have funds in your account yet, you will be asked for you payment details. Click on the blue “Pay” button once you are done. If you want to save up, or even win free tickets, LottoPoint has various deals that fit the bill. For starters, newcomers can get a 100% cashback by simply making their first purchase. Beyond that, newcomers also get a free line just for registering a LottoPoint account. If you plan on becoming a regular player, you can take advantage of their VIP Club program that gives you access to deeper discounts the more you play. Meanwhile, if you choose to subscribe to one of their games, the first re-billing period comes free of charge. The best part is that you don’t really need to do anything extra to get in on these deals: simply register and play. Despite their shortcomings, LottoPoint does get game variety right. Currently, they offer 22 lottery games—from the usual suspects like US Powerball and Mega Millions to less popular ones like Lotto Germany or South Africa Powerball. The prices are quite affordable, too. Unlike many lottery sites that tack on a hefty handling fee, LottoPoint’s ticket prices are just slightly more expensive than the actual retail prices. Of course, most lottery sites actually enter you into the games—but if you’re simply after affordability, LottoPoint is one to consider. LottoPoint also offers several group play games, if you want more chances of winning. There’s one caveat though: LottoPoint’s syndicate share ratios are quite odd. Each player can purchase up to 100 shares per syndicate, but the problem is around 200 people can participate. Why is this a problem? Well, if 200 people bought 100 shares each, the prize pot would have to be split by a whopping 20,000. Sure, it’s highly unlikely that 200 people will buy the maximum number of shares each—but it still doesn’t change the fact that LottoPoint’s odd share ratio makes diluting winnings to a great degree a possibility. LottoPoint utilizes solid security measures to guard against undesirables—but they don’t make efforts to openly advertise it. If you take a look at LottoPoint’s website, you’ll notice something lacking: security and/or trust logos. 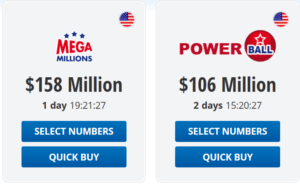 Most lottery sites openly advertise these in a bid to legitimize their business and assure players that it’s safe to use their website. Naturally, I found it strange that they don’t let you know what SSL encryption they use. I dug a bit deeper and found out that they use DigiCert, which put my mind at ease. On the plus side, they do tell you that they are licensed and regulated by the Curacao Gaming Commission. All winnings are taken care of by LottoPoint themselves–they are a lotto betting site, after all. This means that you don’t have to travel to claim winnings. Like most lottery sites though, how the prizes are transferred to you depend on how much you’ve won. For starters, those who win less than $10,000, LottoPoint will notify you by email and deposit the winnings straight into your account. However, if you were lucky enough to win more than $10,000, LottoPoint representatives will call by phone and discuss the next steps with you. LottoPoint doesn’t really provide information about their banking methods upfront—you’d have to dig for them yourself. 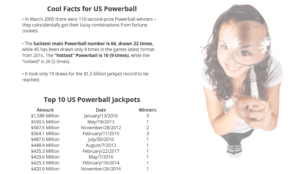 Most lottery sites provide a dedicated page where they detail the banking methods players can use to purchase tickets and withdraw funds, but not LottoPoint. Their FAQs only state that they accept payments “from and to all major credit cards, bankwire transfers as well as a number of secured E-wallets.” I dug a little deeper and found out that they only accept payments from Visa, MasterCard and Maestro. I get why they chose not to be forthcoming about this information—it’s disappointing, after all. I wasn’t impressed with LottoPoint’s customer support—though kudos to them for being easy to get in touch with. Their FAQs, for starters, isn’t exactly comprehensive, but it does touch upon several basic aspects of LottoPoint’s service. It’s passable—and if you need one-on-one assistance, you can get in touch with their team in several ways. You can send them a direct email, or call them up via any of their 4 numbers, or initiate a live chat session. They reply quickly, which I liked. I tried asking their live chat agent about their banking methods but, unfortunately, I was not impressed, to say the least. The agent, Sofia, appeared to be only parroting general information found on their website and not doing much to actually provide me with concrete answers. More than that, when asked what withdrawal methods they offered to players, she started listing withdrawal requirements. It was frustrating having to explain myself several times throughout the conversation just so she could understand what I was asking. It was terrible. Surprisingly, LottoPoint’s lottery education materials are more than decent. They pepper each game page with tons of information—such as prize categories, history, mechanics, and more. There are also pages where you can learn about winning strategies or how to avoid gambling addiction. From game mechanics to interesting facts, LottoPoint’s education materials are brimming with information. One thing that’s lacking though is a glossary, but it’s not much of a loss considering what’s available. LottoPoint’s website is pretty easy to use—and I liked its simplicity, too. You won’t have trouble using their website. If you’ve seen or used other lottery sites, chances are that LottoPoint will immediately feel familiar to you. The layout; the dropdown navigation menu; and the no-frills design are all par for the course. What’s a bit different is that, if you are in a particular hurry, LottoPoint allows you to purchase tickets quickly. Purchase tickets quickly using the Quick Buy option. Each game has a Quick Buy option that lets you forgo the number selection process and head straight to checkout. It makes thing a bit easier, especially if you don’t have numbers in mind. Overall, using LottoPoint’s website was a breeze—that is, if you speak English or French. If not, you might run into difficulties since they don’t support any other languages beside those two. Final Thoughts – Should You Use LottoPoint? There are better options out there than LottoPoint—but giving them a look won’t hurt. LottoPoint does a lot of things right—but for the most part, their shortcomings weigh them down. I’m not a big fan of lotto betting sites—I prefer to be officially entered into games—but what I didn’t like the most was how poor the customer support was. Sure, they responded quite fast, but it was frustrating just trying to get useful information out of the support agent. Beyond that, I also didn’t like how they only accept 3 payment methods (despite their website making it seem like they accepted more than just credit cards). Their website, while quite easy to use, isn’t so friendly to those who don’t speak English or French. Also, their syndicate share ratios are weird and might just dilute winnings. Still, like I said, there are some good things about LottoPoint. They offer a good mix of single and group play games, don’t take commissions, and offers an easy prize claiming process. Plus, I really liked how varied their promotions are—some lottery sites only offer one or two deals, but not LottoPoint. On the whole, however, I wouldn’t immediately recommend them, but it wouldn’t be the end of the world if you checked them out.